Members' exclusive: win pairs of tickets for a very special croquet & cocktail evening at a private residence rarely open to the public - Trumpeters' House in beautiful Richmond upon Thames. On the eve of Open Garden Squares Weekend 2019 (for which we also have a superb money-saving ticket offer for members), 50 lucky ballot winners and a plus-one each will be able to enjoy this exclusive early evening summer event, with cocktails, a talk and tour, a croquet competition and goodie bags included in your prize. Standing between the River Thames and The Green on the site formerly occupied by Henry VIII’s Richmond Palace, the beautiful gardens of Trumpeters' House (pictured above) which overlook the Thames will host staffed croquet matches for Possibilities winners, plus a botanical cocktail bar. Trumpeters' House is a private residence and not usually open to the public. We have 50 pairs of tickets which Possibilities members can win for this exclusive and private croquet & cocktail evening at Trumpeters' House, Richmond, Surrey, on Friday 7 June 2019. The evening starts at 5pm and finishes at 8pm. Two cocktails per guest from a unique cocktail menu themed to the event. An introductory talk by an internationally-ranked Croquet Master. A mini croquet competition between teams, with a prize/trophy awarded to the winning team. An historical tour of the gardens at Trumpeters' House, to include information about London Parks and Gardens Trust and Open Garden Squares Weekend. Tour by London Parks & Gardens Trust director Helen Monger, or one of the LPGT trustees. Goodie bags for all attendees, including an Open Garden Squares Weekend 2019 handbook and more. A beautiful, take-home, printed copy of the ‘Rules of Croquet’. 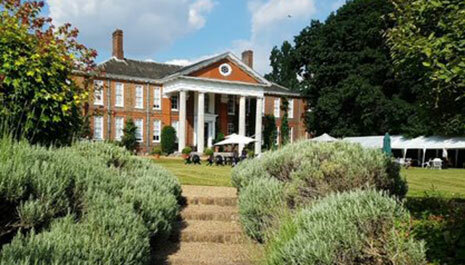 Trumpeters' House & Sarah's Garden, Richmond upon Thames, Surrey, TW9 1PD. Once the ballot has closed and the winners have been drawn, they will be notified by email to confirm they can attend. Winners will be given all the necessary information about how they will receive their tickets. Tickets are non-exchangeable and non-refundable, and cannot be transferred to someone else. Ballot prizes include tickets only, no travel or accommodation is provided unless stated. Winners will be notified within 48 hours of the ballot closing, please double check your spam/junk mailboxes as we wouldn't want you to miss out! This experience is open only to people over 18. 1. The ballot is open to all activated and eligible Possibilities’ members (“Members”), except employees of the Promoter or any third party directly associated with administration of the ballot. Please note that for this balloted event there are no age restrictions on the guests that winners can bring with them. 3. All entries must be submitted via www.saga.co.uk/membership, or by the Member returning by post the entry slip contained within their welcome pack to Saga Possibilities Event Team, Saga Membership Limited, Enbrook Park, Sandgate, Folkestone, Kent, CT20 3SE. Only one entry per Member is permitted. 5. The opening date for entries is 9am on Friday 8 March. The closing date of the ballot is 9am on Friday 5 May. Entries received after this time will not be counted. 7. A winner will be chosen by random draw supervised by an independent person on Monday 8 May. ("Draw Date"). 8. The winner will receive a pair of tickets to a private Croquet & Cocktail evening at Trumpeters House, Richmond, Surrey on Friday 7 June. The evening will begin at 5pm and finish at approximately 8pm. Each winner and guest will receive two cocktails, an introductory talk by an international ranked Croquet Master, participate in a mini croquet competition, a tour of the gardens and a goodie bag each. All drinks, except any free amount expressed on the event itinerary, any travel to and from this event and any other expenses incurred are the responsibility of the winner and NOT included in the prize. 9. The winner will be notified by email or telephone (using details provided when activating their membership) before midnight Tuesday 9 May. If a winner does not respond to the Promoter within 5 days of being notified by the Promoter, then the winner's prize will be forfeited and the Promoter will be entitled to select another winner in accordance with the process described above. 10. The prize will be sent to the winner by post or email (using details provided when activating their membership). An event itinerary will be sent to winners no later than five working days prior to the event taking place. 12. The prize is supplied by Saga Membership Limited. The Promoter reserves the right to replace the prize with an alternative prize of equal or higher value if circumstances beyond the Promoter’s control make it necessary to do so. 14. The winners’ names and county can be obtained by sending a stamped addressed envelope to Saga Possibilities Event Team, Saga Membership Limited, Enbrook Park, Sandgate, Folkestone, Kent, CT20 3SE, or alternatively by sending an email to eventsinfo@saga.co.uk within 15 working days of the Draw Date. 20. The ballot will be governed by English law and entrants to the ballot submit to the jurisdiction of the English courts.